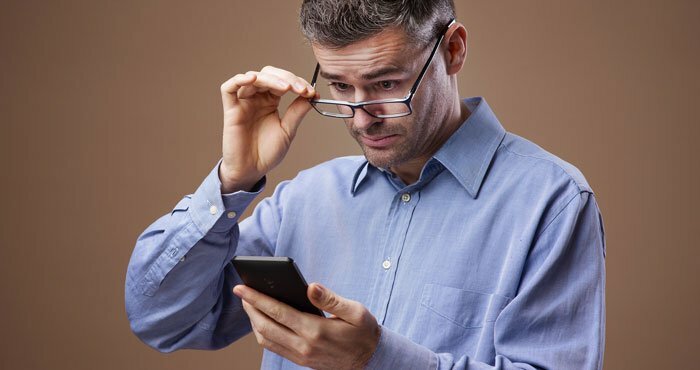 Whether you're suffering from eyestrain or increasing age-related farsightedness, there are times when being able to increase the size of the text on your phone, tablet or laptop makes all the difference. Fortunately, it's easy to enlarge text without increasing the size of your screen. Here’s how you can make your smartphone, tablet and laptop more readable. On your iOS device, you can make many of the same adjustments you have access to on your laptop or desktop machine. You can invert colors, adjust text contrast, zoom or enlarge text. To display larger text in various apps, go to Settings > General > Accessibility > Larger Text, then turn on “Larger Accessibility Sizes.” You can also drag the slider on that page to adjust the overall font size. Under Accessibility, you can toggle on and off Bold Text or Increase Contrast to reduce transparency and darken colors, all of which may make reading the screen easier on your eyes. To invert the colors, go to Settings > General > Accessibility > Display Accommodations, and select Invert Colors. To reduce the brightness of the colors (don’t confuse this with screen brightness), go to Settings > General > Accessibility > Display Accommodations, and turn on Reduce White Point. From there, you can reduce the intensity of bright colors from 25 percent to 100 percent. To magnify your entire screen, use the Zoom function located under Settings > General > Accessibility > Zoom. Once you’ve enabled Zoom, you can double-tap three fingers to zoom, drag three fingers to move around the screen, or double-tap with three fingers and drag to change zoom. On devices running macOS Sierra, access a feature called Zoom to enlarge the content on your screen. To use Zoom, go to System Preferences > Accessibility > Zoom. From there, you’ll need to enable some shortcuts to take advantage of Zoom. One unique function is the ability to zoom in wherever your cursor is located. Check the box for “Use scroll gesture with modifier keys to zoom,” and then select either the Control, Option or Command key as your shortcut button. For example, if you selected the Control key, whenever you place your cursor, you’ll hold the Control key and drag two fingers up or pinch two fingers open to zoom in, or drag two fingers down or pinch two fingers closed to zoom out on your trackpad. Other settings include “Smooth images,” which makes zoomed images appear smooth; “Zoom follows the keyboard focus,” which magnifies the area that has the keyboard focus; and “Zoom style,” where you can adjust the minimum and maximum magnification settings, how Zoom will follow the cursor, and full-screen or picture-in-picture magnification style. For faster access to Zoom, enable the shortcuts under the Accessibility settings. You can even enable Zoom on your Touch Bar. Under Zoom settings, turn on “Enable Touch Bar zoom.” Then hold a finger on the Touch Bar. A larger version will appear on your computer screen. To increase or decrease the zoom, hold the Command key and pinch two fingers open or closed on the Touch Bar. On Windows 10 devices, a tool called Magnifier can enlarge your screen so you can see things more clearly. To open Magnifier, go to Start > Settings > Ease of Access > Magnifier. Move the slider under Magnifier to make adjustments. Alternatively, select the Windows logo key and plus sign or minus sign to enlarge or reduce your screen. Magnifier offers three different view settings: full-screen, lens or docked. Full-screen view magnifies your entire screen, so you can’t view the entire screen at once. Move the mouse around to see the hidden portions of your screen. Lens view acts as a virtual magnifying glass, enlarging only the portion of the screen where your cursor is located. Docked view performs much like lens view, but the main part of your screen remains unchanged. Instead, the magnified portion appears in the docking area as your cursor moves across the screen. Don’t like Magnifier following your cursor around? Adjust your settings and check a box to tell Magnifier to follow your mouse, the insertion point or the keyboard. Select the Configuration (cog wheel) options button to make any changes. (Tip: Under options, select “Turn on color inversion” and see if reversing the colors makes the text on the screen easier to read.) To close Magnifier, select the Close button on the toolbar. 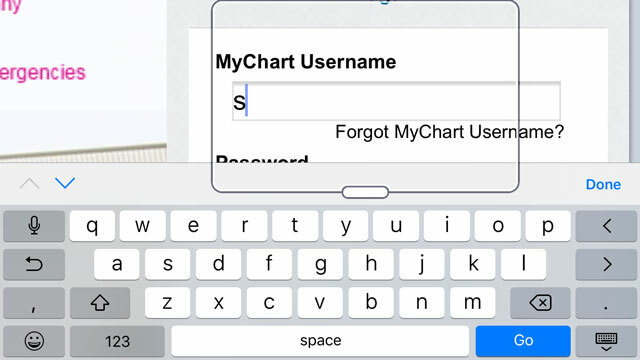 Touchscreen users have access to all the same features. You can open Magnifier and perform adjustments as you would on a mobile device. For example, zoom in and out by tapping on the corners, or move the screen around by dragging the corners. In a hurry? Try these Magnifier keyboard shortcuts. Another way Windows users can make text more legible is a feature now nearly two decades old. Windows introduced ClearType font smoothing technology with Windows XP. This technology displays computer fonts with extreme smoothness and clarity, helping make text more legible, especially after you’ve been reading for long periods of time. 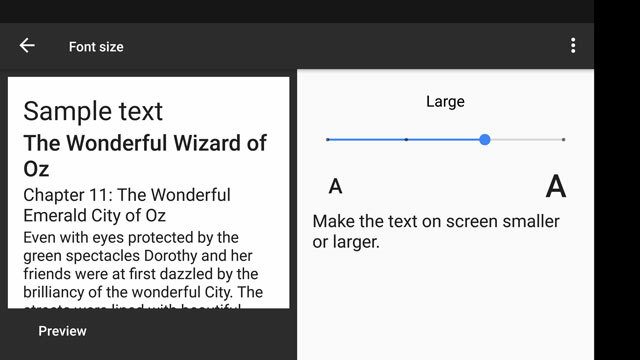 On Android devices, you can adjust the font size, enlarge a screen or adjust the contrast level. To change the font size, go to Settings > Accessibility > Font Size, and adjust the slider on the screen. To change the display size of your screen, go to Settings > Accessibility > Display Size, and adjust the slider on the screen. To make your text easier to read with contrast or inverted colors, go to Settings > Accessibility > High contrast text or Color Inversion. Android lists these as an experimental feature, so they may not work well across your device’s apps. To magnify the screen, go to Settings > Accessibility > Magnification gestures, and toggle it on or off. To zoom on your entire screen, triple-tap anywhere. From there, drag two fingers to pan across the screen, pinch two fingers open or closed to zoom in or out, or triple-tap the screen to zoom out entirely. Google Chrome lets you easily change the size of text, images and videos. Go to Chrome > Preferences > Appearance to adjust your font size and page zoom settings. Under font size, select very small, small, medium, large, or very large text; medium is recommended. 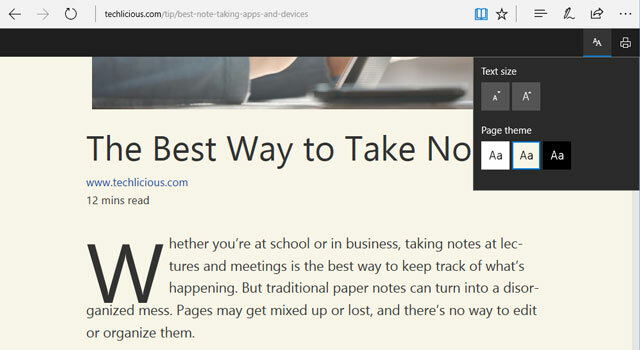 You can adjust the page zoom anywhere from 25 percent to 500 percent. Chrome also recommends adding accessibility extensions to enhance your browser experience. Find them here. On Mozilla Firefox, you can adjust the font size independently of the rest of the web page. Go to Menu > View > Zoom and select “Zoom Text Only.” Whenever you use the “When browsing the web” advice above, Firefox will instead increase or decrease the font size and not the entire page. If today’s web aesthetics favor tiny font sizes too small for your comfort, adjust Firefox to display a minimum text size. Go to Menu > Preferences > Content panel to access this function. In the “Fonts & Colors” section, follow the prompts to adjust the minimum font size anywhere from 9 points to 72 points. Then select OK to save your settings. Microsoft’s Internet Explorer allows you to zoom in on a webpage or change the font size, which may sound disappointing to Windows 10 users. The limitation actually makes sense, since Microsoft users already have rich accessibility features on their machines. So to zoom on a web page, go to Settings (the cog in the upper right) and select Zoom. Then select a predefined zoom level, or make customized adjustments by following the on-screen prompts. To adjust the text size, go to Internet Explorer and select the Alt key to display the menu bar > View > Text size. From there, adjust the text to be smaller or larger to your liking. For Microsoft Edge, click on the three dots in the upper right corner and select Zoom. Then select a predefined zoom level, or make customized adjustments by following the on-screen prompts. To adjust the text size, you'll need to go into Reading Mode. Find an article you want to read and then click on the book icon. Once you're in Reading Mode, you'll see two A's in the upper right. Click on the AA icon and you can adjust the text size. To go back to browsing, click on the book icon again. Since Apple also puts advanced accessibility features on its machines, it also keeps things simple in its web browser. In Safari, you can adjust the zoom function and minimum font size. That’s it. To access these features, go to Safari > Menu > Preferences > Advanced to access Page Zoom and Accessibility. Page Zoom allows adjustments from 50 percent to 300 percent. Under Accessibility, you can require the browser to next use font sizes smaller than a predetermined font size, ranging from 9 points to 24 points. If you’re feeling nostalgic, take the easy route: foldable reading glasses you can carry with you. 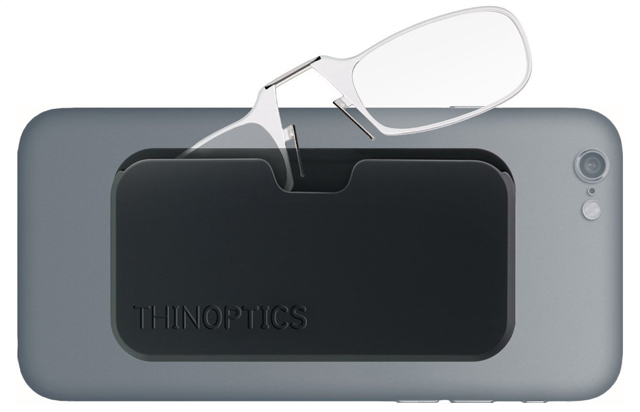 ThinOptics Stick Anywhere Reading Glasses ($19.95, check price on Amazon) are pint-sized frames flexible enough to fold in half to fit in your pocket. They’re strong enough to withstand a drop or two, thanks to their shatterproof polycarbonate design. You’ll never lose track of your reading glasses again. They even come in their own case with an adhesive backing so that you can attach them to the back of your mobile device for easy access. ThinOptics are available in a rainbow of frame colors and come in +1.00, +1.50, +2.00 and +2.50 strengths.